For your convenience, all our rooms are air-conditioned and include an iron, ironing board, hair dryer, organic bath products, safe, telephone, work desk, seating area, high definition tv and complimentary wifi. Whether you’re a couple or traveling solo, The Suite B is there for when you want to live it up. It features a plush Queen bed, one bathroom, two-person dinette set, with a fully equipped kitchen, living room. Fit for two guests, but spacious enough for three, the Suite A has a queen size bed, closet, a studio with a full sofa-bed, and a fully equipped kitchen. It has two different bedrooms, each features a Queen bed, separate bathroom with hot tub. It offers you a large living room and a fully equipped kitchen. 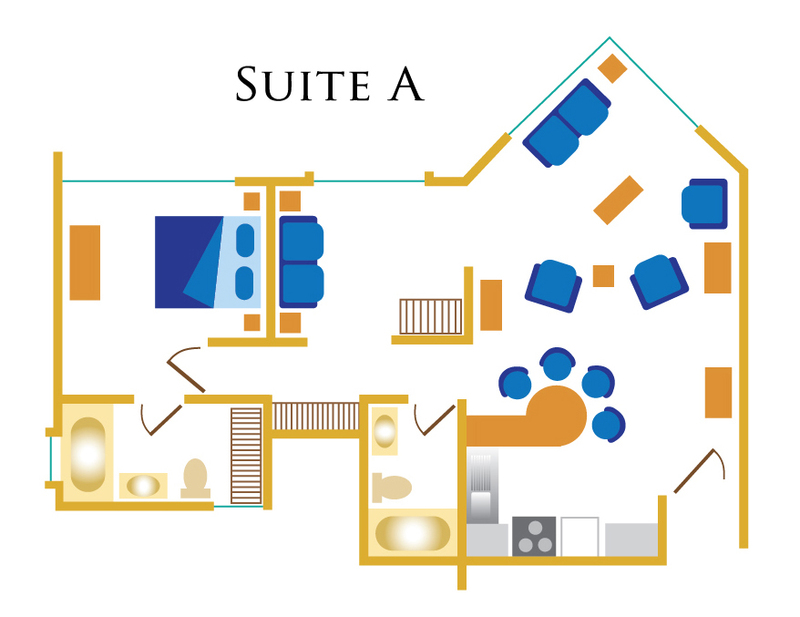 With three separate bedrooms that fit up to six people, The Family Suite is everything a family or group will need. It features a fully equipped kitchen, two bathrooms, and a large living room. It has two different bedrooms, and a studio with a Full sofa-bed. Two separate bathrooms with hot tub. It offers you a large living room and a fully equipped kitchen. A master bedroom with a Queen bed , a mezzanine with two Twin beds, and a studio with a Full sofa-bed. 2 separate bathrooms with hot tub. It offers you a large living room and a fully equipped kitchen.